Liquid anti-scale compound can be sprayed, flow coated, brushed or dipped onto parts to minimize the formation of oxide scale and drastically reduce pitting, decarb loss, cuts down on rework time, too. Has a hot working range of 1000° to 2300° Fahrenheit, crumbles on cooling, and parts rinse clean in hot water. SPECS: 1 pint (16 fl. oz./473ml). Set furnace between 1000° to 2300° F for best results. I am a knife maker & I use this on some of my blades when heat treating. It keeps the scales off my blades and other parts I heat treat. Makes for much easier clean up of parts! 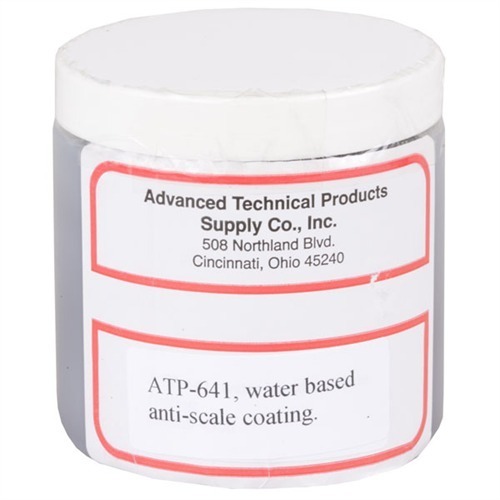 Mfr Part: ATP641 Liquid anti-scale compound can be sprayed, flow coated, brushed or dipped onto parts to minimize the formation of oxide scale and drastically reduce pitting, decarb loss, cuts down on rework time, too. Has a hot working range of 1000° to 2300° Fahrenheit, crumbles on cooling, and parts rinse clean in hot water.